Valentine's Day might be a time when lovers all over the world express their devotion to each other, but that goodwill is not reaching the rose growers of Kenya. One reason is the global financial crisis, which has resulted in a reduced demand for flowers. Another is the erratic nature of the weather because, according to Jane Ngige of the Kenya Flower Council, "when winters are heavy people don't go out shopping for flowers". December to March is the busiest time of year for flower vendors as it takes in the Christmas period, Valentine's Day and Mother's Day. Jane Ngige says 2008 was a magical year for the industry with a record volume of 93,000 tonnes, but the following year that figure decreased by 25%. "We subsequently planned for more volume this year," she says, "but there has been a levelling-off in demand rather than an increase." 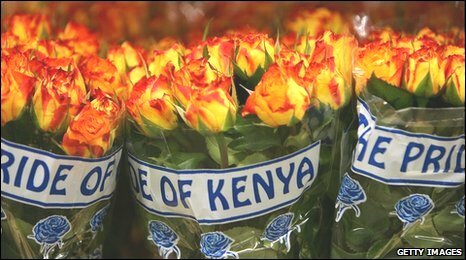 The main market for Kenyan flower growers is the European Union, which takes 65% of the produce grown, followed by Japan and the east European market. "Labour has been scaled down but we are hoping things will improve," Jane Ngige says. "We try to keep workers with us as long as possible," she adds. 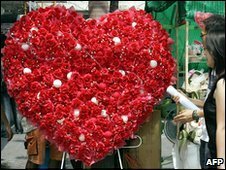 Recent research carried out for Interflora, which has 58,000 florists in 140 countries, shows that half of the respondents were not planning to do anything to celebrate Valentine's Day. The main reasons cited were because Valentine's Day has become too commercial, and because they wanted to save money. Jane Ngige remains optimistic however: "We don't anticipate trends to change. 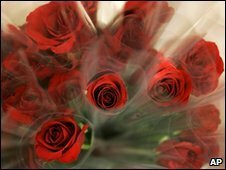 People will want to see their red roses - a sign of romance and a sign of communicating with flowers." For those who will be giving a gift, flowers - and especially roses - top the list, with chocolate and jewellery also getting a mention. Valentine's Day has spawned celebrations of love beyond western culture, although the original meaning seems to have been lost somewhat. In Japan and South Korea, Valentine's Day has become almost an obligation for women to give chocolates, known as giri-choco, to all of their co-workers on 14 February. A reciprocal day on 14 March, known as White Day, has emerged in recent times, whereby men are supposed to thank those who remembered them on Valentine's Day with white chocolate or marshmallows, hence White Day. In South Korea there is an additional Black Day, held the following month on 14 April, for less fortunate men who did not receive gifts on Valentine's Day. They gather together to eat jajangmyun - Chinese-style black noodles topped with a black sauce.